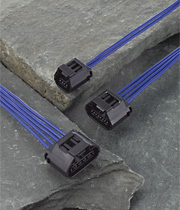 The TL sealed connector series has a mechanism that detects terminal incomplete insertion by using a dedicated jig. This series consists of 2.3mm type supporting use in a variety of control circuits and low power circuits. -To restrain from incomplete engagement, this series is adopted a lock mechanism with effective clear sound. -These male connectors can be directly secured to a bracket on the car body.